For powerful protection against sweat, the best antiperspirant spray for men uses powerful technology. Try Dove Men+Care Minerals + Sage Dry Spray, inspired by earth's natural elements for a boost of freshness and a caring non-irritant formula. This spray takes complete control of wetness – it’s tough on sweat, not on skin. Clinically proven to provide up to 48 hours of protection, this long-lasting antiperspirant spray for men goes on instantly dry. 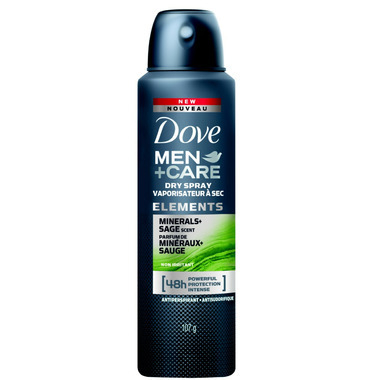 Dove Men+Care Minerals + Sage Dry Spray gives skin complete comfort and protection – for an energizing freshness that lasts. The fragrance contains sage, peppermint, and eucalyptus with the ability to recharge the senses. So, enjoy a boost of freshness with the energizing yet comforting scent of this antiperspirant spray. Men’s dry spray for long lasting protection – apply to your underarm, and feel the difference. Non-Medicinal Ingredients: Butane, Hydrofluorocarbon 152a, Cyclopentasiloxane, Isobutane, Aluminum Chlorohydrate, PPG-14 Butyl Ether, Parfum, Helianthus Annuus (Sunflower) Seed Oil, Disteardimonium Hectorite, C12-15 Alkyl Benzoate, Propane, Maris Sal, PEG-4, BHT, Octyldodecanol, Propylene Carbonate, Dimethiconol, Tocopheryl Acetate.